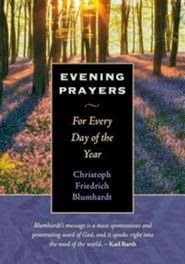 Pastor Christoph Rriedrich Blumbardt's Evening Prayers: For Every Day of the Year is a compendium of his prayers that were collected after his death in 1919. These prayers were originally intended for his close friends and not for publication, but they provide a deeply spiritual and moving collection of devotions for anyone. Blumbardt influenced great theologians like Dietrich Bonhoeffer, and now Evening Prayers demonstrates Blumbardt's insights to everyone. As for the details of the book, Evening Prayers features illustrated monthly dividers and one page for each day of the year with a Scripture verse followed by a brief prayer. Each one begins with gratitude to God for his many provisions, and ends with praise. "Lord God, we thank you for your voice even when it is stern and we must go through hardship and suffering. Your voice speaks to us, and in our voice we can be glad and victorious in our life on earth. Come into our lives. May each of us realize that all we have gone through has been for the good. Be God and Lord over the nations. Be a refuge for all men. Grant that the sin and distress of this terrible time may soon pass and that we may hear your words, 'Be comforted. I will come soon. All these terrors must pass by. My will is being done. My name must be honored. My kingdom and my rule are coming. So take heart and at all times look to your God and Father in heaven.' Amen" (October 27). Whether you read them for reflection and meditation or as "scripts" for prayer, this collection of Evening Prayers has something special to offer all of us.